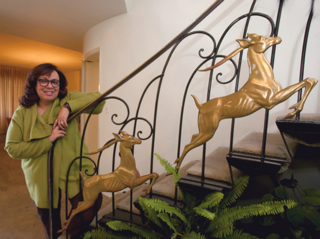 Williams’ granddaughter and biographer Karen Hudson (above) continues to live in the Williams family's 'Streamline Moderne' home (top), built in 1952 in the Lafayette Square area of Los Angeles. True, he designed important public housing projects, starting with Langston Terrace in Washington, D.C. in 1936, in partnership with the leading black architect Hilyard Robinson. 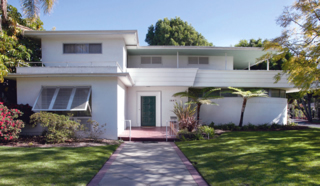 Still, Williams went on to design Nickerson Gardens, another Los Angeles project, in the 1950s. He also designed Berkeley Square, a postwar tract for African-Americans in Las Vegas originally called Westside Park. Williams' “personal interest in the problems of Las Vegas' Westside residents was a major contribution to the new development,” the Las Vegas Review-Journal wrote in 1945. But it wasn't Williams' views on housing that attracted the real ire of black activists. What incensed many were his views on social relations between whites and blacks. 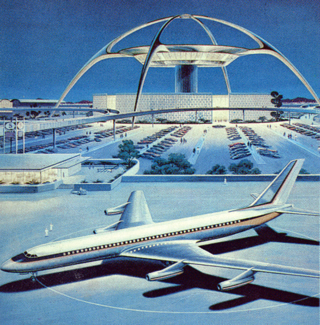 The famous Theme Building at LAX, for which Williams was a design collaborator. Although Williams worked for black clients—designing churches, funeral homes, and offices for black-owned insurance companies and banks—most of his clients, naturally, were white. “He'd walk around construction sites with his hands behind his back so people wouldn't be put into the uncomfortable position of feeling they had to shake his hand,” Karen Hudson remembers. 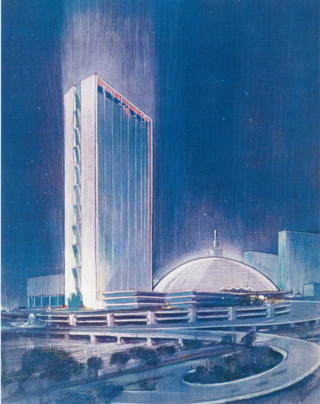 Williams' rendering of 'Satellite City,' which was never built, a modern urban plan with tall business buildings, shopping centers, restaurants, and parks. But if Williams never let prejudice stop him when it came to business, “He accepted in the social realm what he did not accept in the professional world: limitations on what he could do because of race,” Henderson wrote in his thesis. Many black progressives glowered; some used the ‘Uncle T' word.